"Members of the public are advised to disregard this disingenuous creation as it is the handiwork of mischievous persons intent on distracting the commission from the serious work"
The Economic and Financial Crimes Commission wants the public to know that its acting Chairman, Ibrahim Magu, never said that nothing will happen if former Governor Ayodele Fayose of Ekiti State dies in the agency’s custody. The EFCC said this in a statement by its Spokesman, Wilson Uwujaren, on Thursday. The anti-graft agency said there was a fake audio file being circulated on the social media in which Magu was purportedly heard saying nothing would happen if Fayose died in custody. The statement read in part, “The EFCC wishes to alert the general public to an audio recording of a conversation currently circulating in the social media in which the acting Chairman of the Commission, Ibrahim Magu, purportedly made comments to the effect that nothing will happen peradventure Ayo Fayose, former governor of Ekiti State, dies in custody. 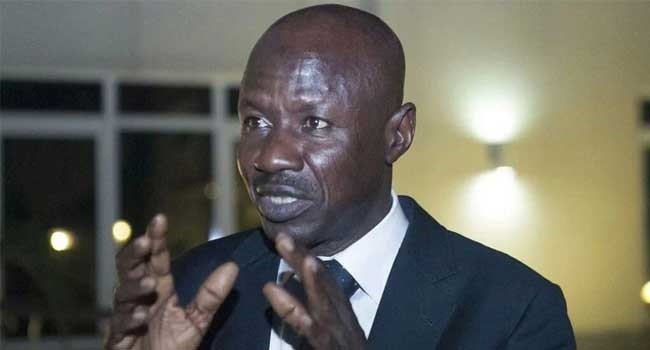 The EFCC said the audio was being circulated by a former National Publicity Secretary of a former ruling party. In his reaction, however, the Chief Press Secretary to Fayose, Idowu Adelusi, said he was baffled by the conversation and by the plot to eliminate his principal because of his opposition to the misrule of the President Muhammadu Buhari's government. He said he remained resolute in opposition to the APC government’s tyrannical rule which had impoverished the people, stressing that the country was moving at geometrical progression to fascism under Buhari.